Ready to assemble studio packages with professional equipment, pre-wired cabling and custom furniture - S2 Solutions! One of the main reasons why people keep coming back to use our S2 Solutions packages is because of the high quality of the technical furniture, in deep solid ash with high quality, hard wearing blue/grey linoleum surfaces. The surfaces are not only robust but also have good acoustic qualities - items dropped on the surface produce a dull thud to which the microphone is not sensitive. Appearances are important, even on radio! As your customers and visitors walk into your studios, they are going to feel that they’ve walked into a professional, smooth-running, radio station. The furniture is modular, so it can be used for a small L-shaped production or talks studio, through to a larger U-shaped on-air studio. It’s easy to fit together with large internal spaces for cable routing, so from every angle, the furniture looks neat, orderly and professional. If you need additions to the woodwork, or modifications, we can produce woodwork to your design which can integrate with our standard furniture to save costs. The furniture has been designed to be easily shipped and then quickly assembled by you on-site. The woodwork is packaged in protective cartons and simple instructions allow you to assemble the furniture rapidly and with a minimum of tools. The SOL-B12 12U support base pod has adjustable feet and provides a solid platform for the SOL-SB1000, or SOL-SB1600, side-return. The side return can also be supported by SOL-LGG80 grey legs which have adjustable feet ensuring that the work-tops are steady and level. SOL-D12 - This 12U high ash top-pod allows more space for further equipment that needs to be close to the presenter. SOL-T12 - This consists of 2 x 6U racks mounted on legs above the work-surface, so that you can use the space underneath for CD/minidisc storage or for paperwork. The packages come complete with prewired cabling, each cable connecting directly from the equipment to the mixer, so that your studio can be up and running in only a few hours. Cabling includes the power distribution, remote control and audio connections to and from the mixer. All the cables can be hidden from view allowing a simple, tidy installation. SOL-CVRC cable covers can be fitted wherever you need cable access through the desktop surface, for example, for microphone leads, or PC monitor cables. For more complex installations, the cabling can be wired to Krone blocks for ease of future adjustment and maintenance. This furniture is for use if you want to use a single mixer, i.e. not a split-frame. With both guest and presenter positions, the package is ideal for hospital radios, RSLs (restricted service licences), sports grounds, colleges and university media studies departments,as well as community and commercial radio stations. The S2 Solutions Single Mixer Package features the Sonifex S2 broadcast console combined with quality broadcasting equipment. The basic furniture is L-shaped and can be installed either left or right-handed, with the SOL-CVR80 end panel protecting the end which is on display. An additional side return can be added to make it U-shaped, allowing more space for turntables, a PC, or a further guest position. The desktop into which the mixer rests can be either 1.3m (SOL-MB1300) or 1.5m (SOL-MB1500) in width, depending on the space that you have available. The configuration of the S2 mixer depends on the equipment that you need for your studio. See the S2 mixer brochure for more information on the input channels available. A simple on-air studio package can consist of 1 high quality presenter microphone on an adjustable microphone arm, 1 guest microphone on a table stand, 2 pairs of headphones and a pair of small book-shelf speakers mounted on desktop speaker stands, such as the SOL-MS21 pair, behind the mixer. giving guests copies of interviews, or for sending commercials to clients. For PC playout automation systems, we can recommend manufacturers to contact and these can be integrated into the package quite easily. The 12U support base pod contains all the remaining studio equipment. An approved telephone hybrid, mixer power supply and power amplifier can be included. An opto-isolated, illuminated “mic live” sign can be located outside the studio door and a studio clock is also essential, although this can be built into the S2 mixer if required. It’s worth noting that the choice, variety and quality of available equipment is large and it changes frequently. So, we’ll recommend the best equipment available at the time of your enquiry. This furniture is for use with an S2 split mixer (i.e. 10-15 channel frame on one side and 10-15 channel frame on the other). The S2 Solutions split mixer furniture comprises U-shaped woodwork which allows space for up to 3 TFT monitor screens in the centre of the presenter’s vision for automated playout, or editing, systems. 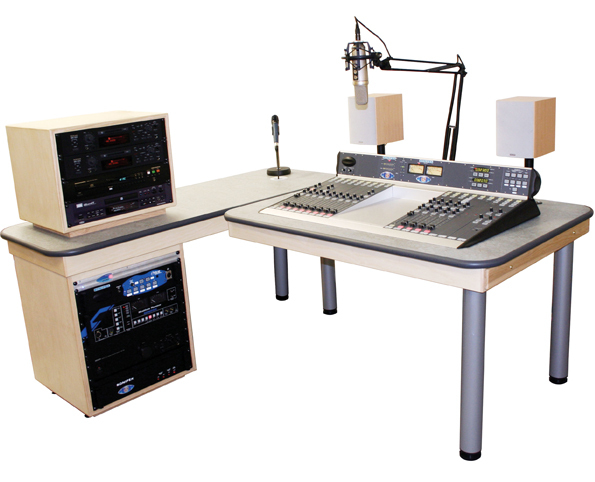 This package has space for 2 guest seating positions, behind the mixers, and is ideal for small scale radio, local radio or smaller studios in larger stations. The choice of equipment is similar to that of the S2 Solutions single mixer furniture except that with the larger space available, you can expand the range and quality of the other equipment chosen, e.g. you may need an additional guest microphone and pair of headphones, a headphone distribution amplifier, a turntable, an additional telephone hybrid to have 2 callers on-air simultaneously or an audio codec to conduct outside broadcasts. Talkback panels can be added and, when combined with the Sonifex Station Master studio switcher and router, a number of studios can be connected together to control on-air switching.